Tri-Village junior Lissa Siler goes in for a score in a game against St. Henry earlier this season. The Lady Patriots are ranked No. 3 in the final Division IV state girls basketball poll. 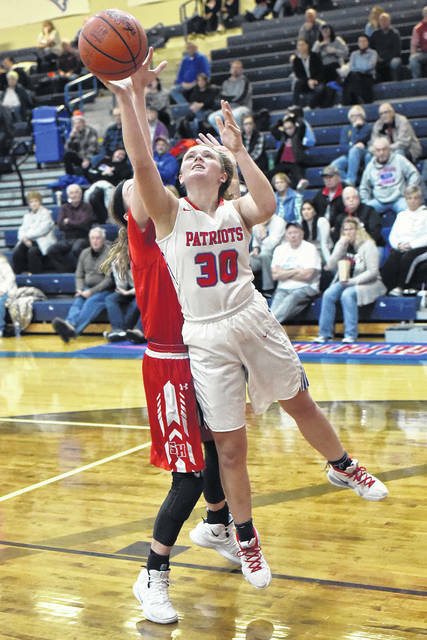 The Tri-Village girls basketball team is ranked its highest of the season in the final girls basketball state poll, released earlier this week. The Lady Patriots (20-1) jumped up one spot to third in the Division IV poll with 1 first-place vote and 149 points. TV is ranked behind No. 1 Fort Loramie (20-1) and No. 2 Minster (20-1). The Lady Redskins received 16 first-place votes and 201 points, while Minster picked up 2 first-place votes and 182 points. Tri-Village was ranked fourth in last week’s poll just behind Fairfield Christian, which fell to fourth in this week’s final ranking. Tri-Village is the No. 1 seed in its Division IV sectional and will open tournament play at 6 p.m. on Feb. 19 against the Miami Valley-Newton winner at Brookville. Also in Division IV, Covington is ranked just outside the top 10 at No. 12 with 23 points. In Division III, Versailles (17-5) had fallen out of the top 10 last week to No. 11 and falls one more spot in the final poll to No. 12 with 19 points. The Tigers were ranked as high as fifth in the poll this season. They will open sectional tournament play against Urbana at 6 p.m. on Thursday at Covington. Columbus Africentric (20-0) remained as the top-ranked team in Division III. The Nubians received 16 first-place votes and 184 points, while Findlay Liberty-Benton (20-0) continued as the No. 2-ranked team with 2 first-place votes and 169 points. Also in Division III, Anna is ranked No. 15 with 13 points. In Divisions I and II, the No. 1-ranked teams remained the same with Pickerington Central (21-1) on top in D-I with 18 first-place votes and 201 points,and Dayton Carroll (20-2) on top in D-II with 11 first-place votes and 159 points. Poland Seminary (20-0) pulled into a tie for the Patriots for the top spot in this final poll. They received 3 first-place votes and totaled 159 points. Canton McKinley (19-1) is ranked No. 2 in D-I behind Pickerington Central with 1 first-place vote and 152 points, while New Philadelphia sits just one point behind Carroll and Poland Seminary in D-II with 3 first-place votes and 158 points. Other regional teams ranked in Division I are Centerville and Wayne out of the Greater Western Ohio Conference. The Elks (20-2) are ranked seventh in the final poll with 1 first-place vote and 104 points. The Warriors are ranked No. 11 with 19 points. In Division II, Trotwood-Madison (18-2) is ranked seventh with 62 points, while Tippecanoe and Franklin are Nos. 11 and 12 with 31 and 16 points respectively. Others receiving 12 or more points: 11, Huber Hts. Wayne 19. 12, Dublin Coffman 18. 13, Eastlake N. 16. Others receiving 12 or more points: 11, Tipp City Tippecanoe 31. 12, Franklin 16. 13, Spring. Kenton Ridge 13. Others receiving 12 or more points: 11, Worthington Christian 23. 12, Versailles 19. 13, Cardington-Lincoln 16. 14, Lynchburg-Clay 14. 15, Anna 13. Others receiving 12 or more points: 11, Newark Cath. 27. 12, Covington 23. 13, Cin. Country Day 13.